Any of us T1’s who were diagnosed before 1975 were probably told that we wouldn’t live past the age of 50. While I didn’t really believe it, that fear was definitely planted in my brain. I spent many high school Christmas holidays at the Joslin Clinic, getting regulated and educated. I knew that if I beat the odds and lived with diabetes for over 50 years, I’d be gifted a Joslin Clinic gold watch. I set my sights on that watch. Fast forward to last year, when I “celebrated” 50 years of living with Type 1 diabetes. I eagerly contacted Joslin, who certainly had all my old medical records … I was ready for my gold watch. Recently I came across an article about the special triumph of us folks living long lives with Type 1 diabetes. It’s a fun and fascinating article. You’ll meet Liz, who was diagnosed 68 years ago, now 77 and an avid quilter and sports fan, flower arranger and a world traveler. 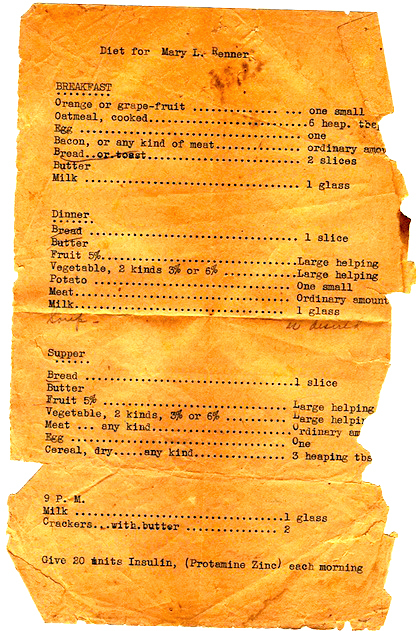 Here’s a copy of the diet she was given in 1948 … notice her dose of Protamine Zinc insulin. How many of you remember that insulin? Then there’s Wallace, diagnosed 62 years ago, now also 77, who says, “I have a general philosophy that diabetics should treat their condition with lifelong acknowledgement but not with restriction. Never let it be a preoccupation in terms of what you do or how you do it.” Interesting. Joslin Diabetes Center (an educational, research and clinical care organization affiliated with Harvard Medical School) is now conducting a study to understand why some people with Type 1 diabetes can live for a long time without developing serious complications. They selected 850 patients from over 3,900 Joslin medalists who have lived with Type 1 diabetes for various milestones, from 25 to 85 years. George King, the director of research and head of the Section on Vascular Cell Biology at Joslin and professor of medicine at Harvard Medical School noted that he has rarely seen people with Type 1 diabetes and Alzheimer’s disease (I found that surprising). And a hot tidbit: he commented that the hair of many women doesn’t turn gray until they’re 70 or 80 years old (YEAH for us ladies!!!). CORRECTION: I must make a correction, pointed out by my dear husband. For my 50 years of living with Type 1 diabetes, I did receive a gold watch … from my loving husband Richard. 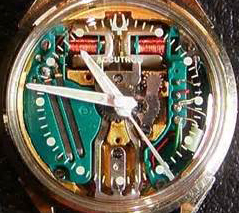 And it is a VERY COOL watch, vintage circa 1965, the year that I was diagnosed! Plus he gifted me a Roberto Coin diamond pendant necklace which I wear daily. It has a small ruby set on the back, in direct contact with the skin of who wears it. According the Coin, this magical signature, surrounded by an antique halo of legend, represents the message of good wishes that he dedicates to his passionate clientele. You’ve created a great site of knowledge!!! Thanks so much for all that you do for your friends and your community, JM! And thank you to Mr. M, too. Thank you Karen … you are an angel in my world! OMG, I so recall the exchange diet. I had to learn that things front and back I walked out fo the hospital and never used it again. Let’s say in 1974 I was not that into structure. Thanks so much Rick. I used to come home from the Joslin Clinic stays with diets that included cutting a corner off of a piece of bread to make it EXACTLY 30 grams. Never did that! I wrote a long email and suddenly it ran out of space. I will try to shorten it, I was diagnosed as a Type 1 diabetic in 1950 at 11 years old. I am now 80 years old and doing well. I received my 50 year medal and now I am interested in the surviving Beta Cells and hope I might be able to find a cure for this dreaded disease.